Sitting together around the table to eat together just three times per week reduces the odds that kids will be overweight, reduces the odds of their eating unhealthy foods or eating in an unhealthy way, and increases the odds of eating healthy foods, according to a study in the June, 2011 Pediatrics. This study pooled the results of seventeen previous studies involving 182,836 children. Some of these studies have shown significant benefit from seven or more meals together a week – or even five or more – going well beyond measures of diet and weight, to include school performance, mood, and risky behavior. Taken together, the studies show that even a more modest number of family meals each week is linked to an overall decrease in soda, fast food, fried food, and candy and other sweets throughout the week. Meanwhile, these same kids were more likely to eat fruits and vegetables. It’s no surprise that they would also have a healthier weight overall. The current study demonstrates the connection between family meals, healthier eating, and healthier weight – but can’t show which causes which. Previous studies have done that. The more data I see, the more I become convinced, one of the best things we can do for our kids is to share meals with them, around a table, in a home – and especially meals they had a hand in preparing. Hammons, AJ and Fiese BH. 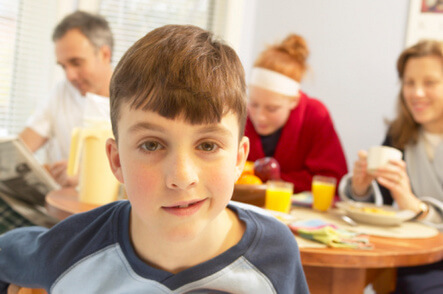 “Is Frequency of Shared Family Meals Related to the Nutritional Health of Children and Adolescents?” Pediatrics. June 2011; 127(6):e1-10.